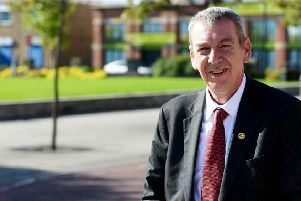 The top cop who leads a North East police force has said Government cuts had been "traumatic" for the organisation. Appearing at the Commons Public Accounts committee, Durham Constabulary's Chief Constable Michael Barton told how pressures on finances had continued for longer than first pledged by the Government. Durham Constabulary's Chief Constable Mike Barton pictured as he addressed a conference last year. His views were given as he addressed Parliament following on from West Midland's chief Dave Thompson, who told of how police budgets have seen a real terms reduction of 19% since 2010. The watchdog found arrest rates and victim satisfaction levels are on the slide, and flagged up reductions in the percentage of crimes resulting in charges. Separate analysis by the Press Association revealed hundreds of thousands of residential burglary, vehicle theft and shoplifting investigations are closed without a suspect being identified. Mr Barton told the committee: "I actually think - and I'm not popular on this - that the public sector needed an incentive to change and improve. "I think the budget cuts we faced in 2010 and 2011 were helpful to the organisation ... because we became much more private-sector motivated with a public-sector heart. "The problem has been ...it's that length of time. "When that kicked in we were told we could cut hard, cut deep, cut once and austerity would end in 2015 and that has not been the case and that has been so traumatic." However, he added: "I'm not going to start sounding the death knell of policing because number one it's not true, and number two it's not helpful to the public." Home Secretary Sajid Javid appeared to signal a shift in the Government's stance earlier this year when, within weeks of his appointment, he pledged to prioritise police funding in the next spending review. A Home Office spokesman said: "We remain committed to working closely with police and delivered a £460 million increase in overall police funding in 2018/19, including increased funding for local policing through council tax. "We are also working with the police to put forward the evidence to ensure they receive the resources they need to do their vital work at the next spending review."